Forex strategy "Early bird Breakout System"
Another advanced morning strategy tightened to the timing factor and only two currency pairs. Currency pair: preferred but not limited to EUR/USD and GBP/USD. 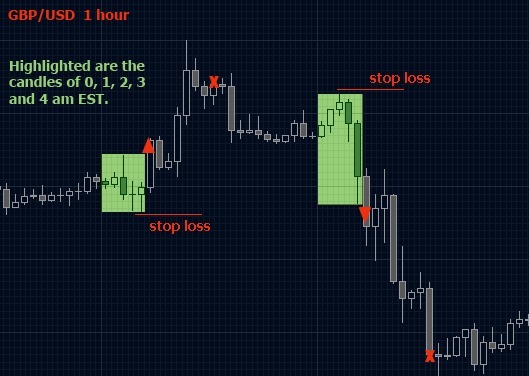 This Forex breakout system uses no indicators. The system is called "early bird" because it requires a trader being ready to trade Forex as early as 5:00 am EST. Find the Highest High and the Lowest Low for the candles from 00:00 EST to 4:59 am EST. (We should have 5 candles for each hour: 0, 1, 2, 3 and 4). At 5:00 am EST set 2 entry orders: buy order - above the highest high +5 pips, sell order - below the lowest low and -5 pips. Set initial profit target to +90 pips for EUR/USD and +140 pips for GBP/USD - both targets are way too high if to consider that daily range average for EUR/USD is only 110-120 pips and daily range average for GBP/USD is 180-200 pips. If those targets get hit - very good! However, our profits will be determined mainly by the time factor instead of a fixed amount of pips. So, we close all open positions at 12:59 EST (1:00 pm EST) and cancel all remaining orders. The next trading opportunity - only next day at 5:00 am EST. Forex strategy "Martingale Trading System"